Gen. PI. 3: 240. 1837. Pothos myosuroides H.B.K., Nov. Gen. Sp. PI. 1: 75. 1815. TYPE: New Granada. Quindio: between El Moral and Paso del Machin, Bonpland s.n. (P). Pothos microstachyus H.B.K., Nov. Gen. Sp. PI. 1: 75. 1815. Anthurium microstachyum (H.B.K.) Kunth, Enum.Pl. 3:72.1841. TYPE: New Granada. Quindio: between El Moral and Paso del Machin Goudot s.n. (P). Epiphyte, scandent; stems elongate, moderately thin; internodes 4.5-5.5 cm long; cataphylls 7-10 cm long, drying brown, persisting at upper nodes. LEAVES erect to spreading; petioles 4-13 cm long, weakly sulcate; blades subcoriaceous to moderately thin, usually elliptic, sometimes more or less ovate, 17-21 cm long, 6-10 cm wide, broadest at middle or just below; anterior lobe 15-19 cm long, the margins convex; posterior lobes 1.5-3.5 cm long, from apex of sinus to outermost point; sinus parabolic to weakly hippocrepiform, the apex rounded; both surfaces matte on drying; midrib prominulous above, more prominently raised below (dry); basal veins 3-4 pairs, free to the base, prominulous above, raised below, yellow (dry); primary lateral veins 6-7 per side, departing the midrib at 40-45¡ angle, straight to collective vein, prominulous above, raised below (dry); lesser veins visible on both surfaces (dry); collective vein arising from the first basal vein, loop-connecting the primary lateral veins, 5-7 mm from margin. INFLORESCENCE erect-spreading (? ); peduncle 10-16 cm long, ca. 2 mm diam. ; spathe moderately thin, green, lanceolate, 4-6 cm long, ca. 0.9 cm wide, acuminate at apex, acute to more or less rounded at base; spadix stipitate to 1.5 cm, yellow, 6-9 cm long, 5-6 mm diam. near base, 3-4 mm diam. near apex; flowers rhombic, 2.7-3 mm long, 2.2-2.5 mm wide (dry); the sides sigmoid, 3-5 flowers visible in the principal spiral, 5-6 flowers visible in the alternate spiral; lateral tepals 0.6-0.7 mm wide, the inner margins convex; pistils scarcely emergent; stigmas inconspicuous; stamens emerging in a regular sequence throughout the length; anthers held at sides of pistil; thecae ovate, weakly divaricate. INFRUCTESCENCE not seen. Fig. 98. Anthurium myosuroides ranges from Panama to Colombia and perhaps also to Ecuador at 700 to 2,000 m. In Panama the species is apparently rare, occurring only in tropical wet forest at 700 to 850 m.
The species is a member of section Xialophyllium and is distinguished by its slender stems with elongate internodes, its thin, veiny, oblong-ovate leaf blades that are narrowly subcordate at the base and broadest in the middle, its long-pedunculate, yellowish to orange spadix, and by its green oblong-lanceolate spathe. The species can be easily confused with Anthurium microspadix, but in Panama that species is restricted to Chiriquí Province and differs in having the blades widest in the lower one-third or at the base, whereas the blades of A. myoauroides are broadest near the middle. Anthurium myosuroides was long confused with A. flexile ssp. flexile, and Engler even described A. myosuroides var. angustifolium, which is now considered synonymous with A. flexile. The two species are, however, not related. Anthurium flexile, a member of section Polyphyllium, has a wiry stem with many roots in between the internodes. Anthurium myosuroides has a much thicker stem with roots restricted to the internodes. 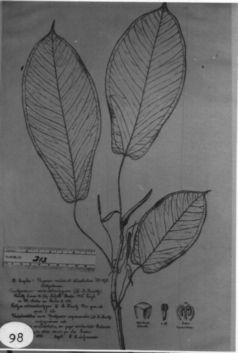 Engler's drawing number 370 labeled Anthurium microspadix is actually A myosuroides. See Fig. 98. Colombia Antioquia: 1650 m, 6.54N 75.01W, 5 Dec 1989, Callejas et al. 8974 (NY). Colombia Antioquia: 1850 m, 6.15N 75.32W, 23 Oct. 1983, Andrian Juncosa & Guillermo Misas 1000 (MO). Colombia Antioquia: 2060 m, 5.57N 75.52W, 25 January 1990, Thomas B. Croat 69947 (MO). Colombia Antioquia: Murr’, 1620-1860 m, 06.45N 76.23W, 10 February 1989, J.M. MacDougal, D. Restrepo & D.S. Sylva 3851 (MO). Colombia Antioquia: ca. 2100 m., 7.10N 75.28W, 8 Nov. 1987, Luteyn & Maruleda 11900 (NY). Colombia Antioquia: 2220 m., 05.40N 75.48W, 10 June 1987, Callejas et al. 3973 (NY). Colombia Antioquia: 1800-1900 m., 05.30N 75.50W, 8 June 1987, Callejas et al. 3796 (NY). Colombia Antioquia: Las Orquideas, 1450 m, 06.32N 76.19W, 01 Diciembre 1993, A. Cogollo et al. 7642 (MO). Colombia Antioquia: 2030 m, 06.08N 76.09W, 31 October 1987, Alan E. Brant & Julio Betancur 1558 (MO). Colombia Antioquia: 1800-2300 m, 6.10N 75.30W, 15 Mar. 1989, Callejas et al. 7343 (NY). Colombia Choco: 910-920 m, 5.45.00N 76.21.30W, 11 March 1984, Thomas B. Croat 57343 (CHOCO, MO). Colombia Choco: <50 m, 05.14.30N 76.41.00W, 13 Mar 1984, Croat 57386 (CHOCO, CM, MO, COL, JAUM). Colombia Choco: Río Atrato, 1600 m,, 11 Dec. 1979, Thomas B. Croat 49255 (MO). Colombia Putumayo:, 28 Julio 1990, L. Garcia, et al. 111 (MO, CUVC). Colombia Valle del Cauca: 1500 m, 03.50N 76.30W, 14 July 1984, Al Gentry, M. Monsalve, A. Meerow, D. Wolfe & T. Teefs 48046 (MO). Colombia Valle del Cauca: 2100 m, 4.49N 76.08W, 10 May 1983, Thomas B. Croat 56605 (CM, COL, F, MO). Colombia Valle del Cauca: 1430 m, 3.54N 76.33W, 13 May 1983, Thomas B. Croat 56741 (COL, JAUM, MO). Colombia Valle del Cauca: 03.28N 76.39W, 12 Feb. 1990, Thomas B. Croat & Jonathan Watt 70497 (MO). Colombia Valle del Cauca: 2080-2100 m, 03.55N 76.04W, 16 Feb. 1990, Thomas B. Croat 70646 (MO). Colombia Valle del Cauca: 1485-1550 m, 03.52N 76.22W, 17 Feb. 1990, Thomas B. Croat 70713 (MO). Colombia Valle del Cauca: 1600 m,, 16 enero 1985, Wilson Devia A. 907 (MO). Colombia Valle del Cauca: 100 m,, 30 Abr 1994, J.E. Ramos y L.H. Ramos et al. 4048 (MO). Ecuador Napo: Sumaco, 1200 m, 00.43S 77.36W, 17 Sep 1988, Fernando Hurtado & Angel Alvarado 475 (MO). Ecuador Napo: Sumaco, 1000 m, 00.43S 77.34W, 18 May 1989 - 21 May 1989, Fernando Hurtado & Angel Alvarado 2133 (MO). Ecuador Napo: Sumaco, 800-1000 m, 00.43S 77.32W, 23 Aug 1989 - 30 Aug 1989, Carlos Cer—n & Miriam Factos 7445 (MO). Ecuador Napo: Sumaco, 1200 m,, 12 Dec 1987, Walter Palacios 2236 (MO). Ecuador Pastaza: 1030 m,, 16 May 1978, Kennedy 3861 (MO, SEL).